Cristiano Ronaldo will miss Real Madrid's La Liga match at Real Sociedad on Saturday with a knee injury, says coach Carlo Ancelotti. The 29-year-old forward was substituted during Real's 3-0 victory against Borussia Dortmund in the first leg of their Champions League quarter-final. Cristiano Ronaldo has scored 44 goals in 40 matches for Real Madrid in all competitions this season. 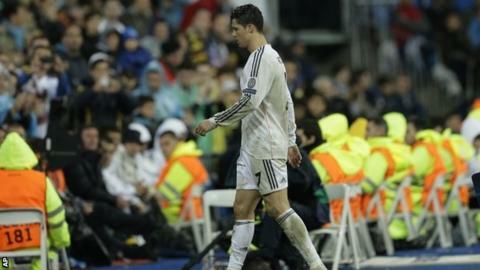 "We will rest Cristiano because he is a bit tired," said the Italian. "We want to avoid taking any risks, we have a lot of important games coming up." Real are involved in a three-way battle with Atletico Madrid and Barcelona for the Spanish title and travel to Germany to face Dortmund in the return leg on Tuesday. Ancelotti's side are three points adrift of leaders Atletico, and two behind Barca, with seven matches left before Real play at sixth-placed Sociedad. "For the Sociedad game we prefer to leave Ronaldo at home to work so he can be ready for the match on Tuesday," added ex-Chelsea boss Ancelotti. "He will be fresher and he can recover better. I spoke with him and we decided it would be better to rest." Spanish newspapers reported last week that the Portugal international had been suffering from an injury in his left knee since the 3-1 Champions League win at home to Schalke on 18 March. After Wednesday's 3-0 win against Dortmund, Ancelotti said the problem was just "a minor annoyance".